Welcome to the JCHS Senior webpage!!! Tuesday, April 16 and Wednesday, April 17, 2019. They will be in the Landing from 11:20 a.m. - 12:20 p.m. If you have not paid for your cap & gown, please do so at this time. They accept cash, checks, money orders, cashier checks, and credit cards. James Clemens High School graduation time has been changed to 7:00 p.m. This change is to ensure that all graduates, family, friends, and staff will be able to enter the Von Braun Center prior to the graduation start time. We regret any inconvenience this change has caused. Thanks so much for making your senior orders. T-shirts, breakfast and barbecue orders have been placed. See you in late April. BALFOUR @ JC THIS WEEK!!!! Thursday, February 28 and Friday, March 1, 2019. CAP & GOWN Pictures - Click here for more information. Balfour will return to James Clemens on January 17 & 18, 2019. Please complete the Google Form at the link/QR Code below. You can edit the information if there are any changes up through April 24, 2019, then you will need to contact Mrs. Meskunas directly. Balfour will take orders for graduation, collect cap & gown payments and any additional payments that are required. Balfour is the graduation cap & gown supplier. They will be at JC on the dates below. This is a great time to make your cap & gown payment if you have not already done so. Tuesday, September 18, 2018 11:20 a.m. (seniors only) & 11:50 a.m. (juniors only) in the auditorium – during this time, the students will receive packets that include all information available for purchase. Students that are not in school on this day can pick up a packet from the front office or in Room B115. Monday, September 24, 2018 5:00 p.m. - 7:00 p.m. in the Landing (parents & students) – during this time parents can come and speak to the Balfour representatives and make payments. Balfour accepts cash, credit cards, money orders and cashier’s checks. 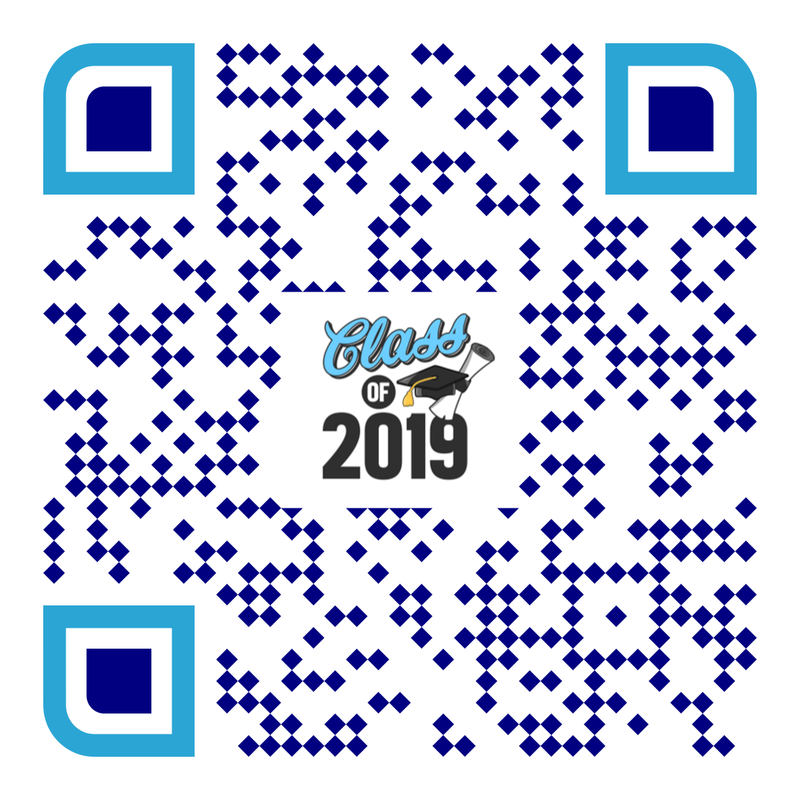 Click here (students must be logged in with their MCS google account) to place your cap & gown, t-shirt, breakfast, and barbecue orders. Senior fees must be paid in order to receive the last three items. Pay Balfour directly for cap & gown. Cap & gowns will be delivered to JCHS and will be given to the seniors in May. Any athletic fee, class fee, library fee, lunch fee, etc. ALL fees must be paid before receiving cap & gown for graduation. 08/23/18 5:00 p.m. – 7:00 p.m.
03/09/19 8:00 p.m. – 11:00 p.m. Doors open for guests @ 6:00 p.m. Graduates will receive 10 tickets for entry to graduation. If you need additional tickets, please see one of your classmates that may not use all of their tickets. Girls: Solid color dress in a light color (i.e., pastels, light gray, white, etc.) Shoes should be neutral in color (i.e., white, black, brown, beige, light gray, etc.) Cork wedges are okay to wear as well. Practice: 10:30 a.m. Attendance is mandatory. Ceremony: begins @ 7:00 p.m.
JCHS graduation will be streamed live. Please go to www.madisoncity.k12.al.us. Information and link are listed on the main page.